Regional Lunch was a highlight for me (we just ate at the cafeteria in the Kennedy Center, but I must recommend the calamari po'boy, it was top notch!). I don't believe we had this last year (or if we did, maybe I didn't go for some strange reason?? ), but to share some time with a group of six Philly-metro dramaturgs was pretty awesome. I learned a lot about what's going on in the area (like that PlayPenn is going on right now, so a lot of area dramaturgs were busy), and am thrilled with the involvement potential. The Annual Meeting was next, and it was great to hear some statistics [72 individual members in the US (59 in Canada) and 54 student members] about the growth of LMDA. Updates about the website and the journal were discussed, and of course there were a few board transitions. They did announce next year's conference will be at the Banff Center near Calgary, which was hard for me to swallow. While we're getting a good deal on lodging and food (this is a retreat-type center), airfare is currently around $700 roundtrip from PHL, and I don't know if it'll go under $500 from what I read online. But, it's practically a year away, so there's time yet. I then went to a mind-bending session on Digiturgy, or Digital Dramaturgy. All four presentations were great, and I was among the MANY to line up and give our names as volunteers to help with a new database project. The most impressive way to think about digiturgy in the audience sense (as opposed to for the actors, etc.) was the comparison to "extras on DVDs," and that was quite thought-provoking for me. A few of us went for a cup of coffee (mocha in my case) at Cup'a Cup'a, a local place next to the Kennedy Center during the break. 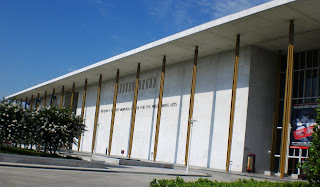 I took some pictures of the Kennedy Center (and the view from it) as well. 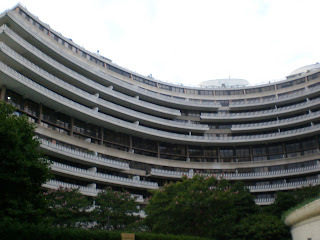 Afterward, we migrated over to the Watergate Hotel, where we had our banquet at 600 Restaurant. The setting was a bit different from last year, in that the tables were mostly four people, whereas last year they were much bigger. We were also spread out into multiple sections, so when speeches were given, many of us had to stand in the main room to hear (and eventually sit on the floor, as time went on). But it was great to have the opportunity to talk with a few more people (although I sat with 2 people I had met back on the Library of Congress tour, the third person was new to me and had smart things to say). The Caesar Salad was average, the bowtie pasta with asparagus was plain (I actually added pepper), and the apple pie was not completely cooked. The bread, however, was quite good... and our table polished off two baskets before the salads were even out. More amazing things were said by those who gave/received items/awards, and I can't wait to buy Geoff Proehl's new book. The only sad thing was that one of the "auction items" was a flag that had been flown at the US Capitol, complete with a certificate dedicating its service to the LMDA... it raised only $50. An old t-shirt even got $55! But, the application of a shirt is much greater than a flag, so I guess that was a part of it. Leaving the banquet, a friend had given me her farecard - she was leaving town in just a few hours, and knew I was having horrible luck. It turned out to be a miracle card, since I was able to get three rides from it without a demagnetization! I got to the hotel that night and slept well. In the morning, I slept a bit long and ultimately missed the first session on "Theatre of War." Worse though, was my trip to the final session. I checked out with plenty of time, and lugged my bags to the metro. I entered without a problem and went to wait at the Glenmont platform. The area was crowded, and I quickly was made aware that the 10:15 train didn't come, and the 10:21 wouldn't be coming, either. Those were my two possibilities, so I became slightly frustrated. A moment later, the boards showed 20 minutes until the next train, so I put my shoulder bag down and went to lean against the wall.... in doing so my sunglasses tipped off my head and back behind a 15-foot cement barrier. Since I had time to kill, I went to plead with the station manager for assistance. She was more than willing to help me out, and actually built a pole-like device to retrieve them. I ultimately board the first train, only having to wait 10 minutes for a transfer (which was nothing in comparison to what ended up being 40 minutes for the first leg). I got to the final session of the conference at 11:40, so I made the last 50 minutes or so. We did a group sharing moment, revealing enlightening/memorable events... 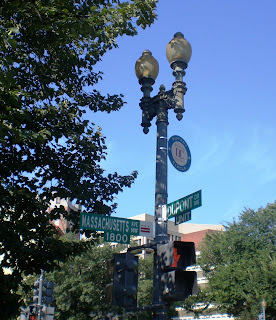 I mentioned the awestruck feeling I had with the documents we got to see at the Folger, and the awesome networking that took place this conference for me (my first LMDA conference was partially dwarfed by my shyness around famous-in-the-field people). Because really, this conference did a lot for me because of the people I spoke with. Finding out what others were working on, how they got their current positions, where they did internships, how they use their degrees, etc. was quite eye-opening. 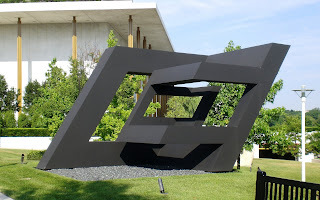 To know that many of the ECDs I met this year (I also reconnected with two I met last year) could be my colleagues-of-sorts for the next forty years was just plain neat. Leaving DC wasn't a picnic (back to the metro, over to the airport, a shuttle to the terminal, no free wi-fi, junky sandwich, two-and-a-half hour layover in Atlanta, worst Sbarro ever, tiny under-seat space on plane), but I prefer to end this entry on the positivity of remembering the wonderful people with whom I have become acquainted, and whom I look forward to seeing year after year to come.